A liquid molybdenum fertiliser for foliar application on all types of horticultural crops. 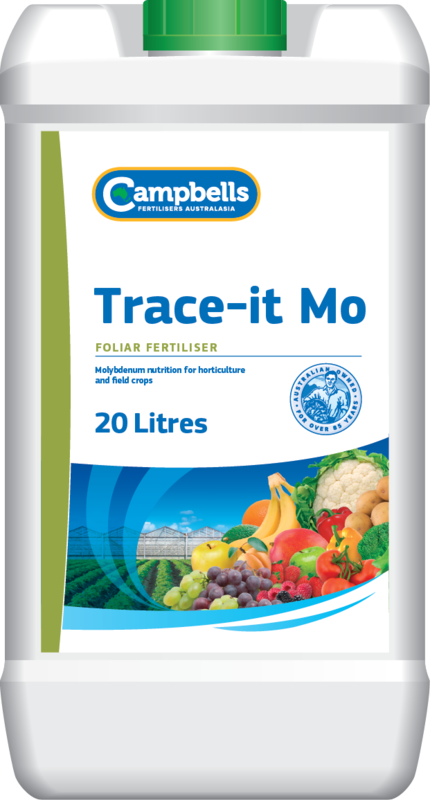 Campbells Trace-it Mo is a liquid fertiliser that is ideal for the prevention or correction of molybdenum deficiencies in many horticultural crops. The high level of available molybdenum in Trace-it Mo makes foliar applications extremely effective. Molybdenum has a key role in the function of nitrogen metabolism. It is necessary for chlorophyll formation as well as iron and phosphorus metabolism. Although required in very trace amounts, deficiency can lead such issues as reduced plant growth and reduced leaf area. Campbells Trace-it Mo is recommended for foliar application. Recommended rates of application vary between 150 to 500 ml/ha – specific rates will depend on the crop, stage of crop development and the molybdenum requirement. Before application, seek advice from your Campbells Trace-it Mo distributor or your local agronomist.